Have you ever wondered why you see crumble recipes for berries ,pears, apples…just about any fruit but bananas? We generally just don’t think about bananas when we think about fruit desserts like, crisps or crumbles. I wonder if it’s because we don’t think they would hold up to being baked? I can tell you first hand after making this Banana Crumble that they can and did hold up very well. I think the ripeness of the bananas being used has a lot to do with that. We’re used to using very ripe bananas for baking, the blacker the better as a matter of fact. When you make a Banana Crumble, you want the banana to be ripe as far as being a nice bright yellow without any green on it or any signs of starting to over ripen. The recipe came together very quickly, the topping is made first and refrigerated. The next step is slicing the bananas and putting them in a cast iron or oven safe skillet to lounge around in a cooked mixture of butter, brown sugar,orange juice and cinnamon. Let me just say here that I was excited to make this crumble, that excitement went up about ten notches when I was cooking the butter/brown sugar, cinnamon mixture. The moment I poured the orange juice in the pan it danced around and released an amazing aroma, all I could think of was…I want to know what that wonderful scent tastes like. The bananas are gently tossed in the mixture long enough to get coated. The topping is sprinkled on top of the bananas and go in the oven to bake just until the topping is golden brown, about twenty minutes. While I waited I scooped out the ice cream and put the scoops in the freezer in anticipation of having a lovely dessert to accompany them. Time was up! Out it came, I stood and marveled at it, the oats, the pecans, the golden bananas…I just needed a small taste. I ate from the pan totally amazed at the flavors and textures I was tasting. I forgot all about the ice cream. 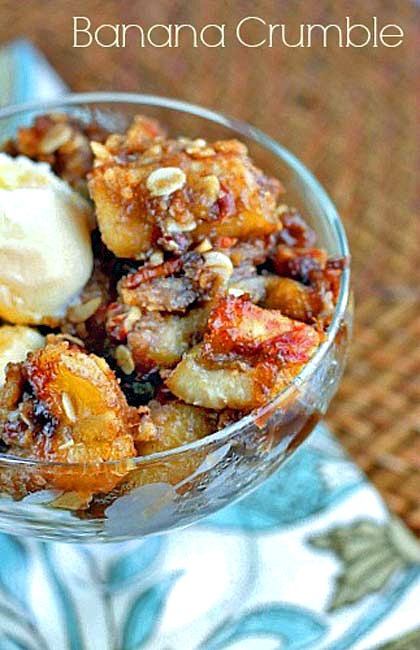 Banana Crumble, add it to your “must try” list and Enjoy! Combine all the topping ingredients ( except pecans) in a medium size bowl and work them together with your fingers until they become crumbly. Add the toasted pecans to the bowl. stir to mix. Refrigerate the topping while you make the filling. In a ten inch cast iron skillet or oven safe skillet, melt 2 tablespoons of butter over low heat. Add the brown sugar and stir until it dissolves about 3 minutes. It will become a wet looking mass of sugar that slides around the pan. Stir in the cinnamon and salt. Add the orange juice, be careful it will sizzle up and splatter a little bit. Cook about one minute until it thickens slightly. Add the banana chunks and toss gently until they are coated. Spread the bananas and sauce out evenly in the pan. Remove the skillet from the stove,sprinkle the topping evenly over the bananas. Put the skillet in a 350 degree preheated oven and bake until topping is golden brown about 20 minutes. Let cool in the pan about 10 minutes before topping with vanilla ice cream Or Whipped cream. Stunning dessert that no one could refuse; bananas are always welcomed with open palates at our house! This looks wonderful, and good to know that the bananas hold up in this! Sounds absolutely delicious! Wow, this looks so good! I love bananas and love crisps, but have never thought to put the two together. Will have to give this a try. Any suggestions if I don’t have an oven safe skillet? Hi Kerby, first you’ll love this crumble! Second, np skillet, just use a 13×9 baking pan. I’m always looking for ways to use up bananas-so your post definitely caught my eye!! PINNING!! Thank you so much for sharing at The Wonderful Wednesday Blog Hop!!! 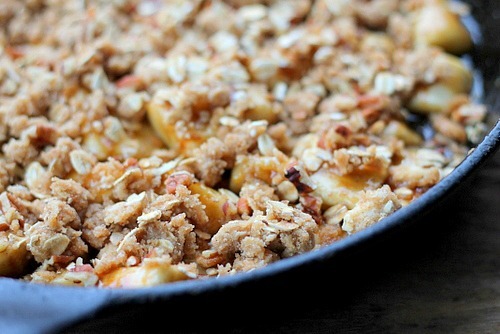 I would’ve never thought to try bananas but your crumble came out beautifully!Pinned! I was so pleasantly surprised when I made this Momma Baker, it’s absolutely delicious! Oh yum… Not only does this sound good… but your pictures make me want to dive in! I am making this for a friend who can’t have nuts. Do I need to add more oatmeal if I’m leaving out the pecans? Yes Tyann, add a little more oatmeal to make up for the nuts. This one was a winner. My kids loved it. Only thing is, I reduced the amount of sugar and replaced the pecans with walnuts. I LOVED this Lyra, just imagine making it and topping oatmeal with it!! Thank you for coming back to tell me you made it!